Translators Thor Polson and Elana Wolff will be joining up for a west-coast pre-launch presentation from Guernica’s first flip book —a new translation of Franz Kafka’s stories from A Hunger Artist and A Country Doctor and the first-time translation, from the Hebrew, of Poems and Songs of Love by Kafka’s friend Georg Mordechai Langer. The pre-launch will take place on Sunday, August 31 at The River Maiden coffee house in Vancouver, Washington. The reading will start at 2:00pm and will go until 4:00pm. This collaborative translation by Elana and Menachem Wolff brings the fascinating work of Langer – poems as well as an essay on Kafka – to the English-reading public for the first time, and sheds light on a hitherto unexplored relationship. 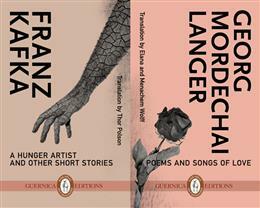 Kafka’s writings are characterized by an extreme sensitivity manifested in absurdity, alienation, and gallows humor, and “Poems and Songs of Love” is a translation of the collection “Piyyutim ve-Shirei Yedidot” by Georg Mordechai Langer, which contains an elegy to Langer’s friend and mentor Franz Kafka. Langer and Kafka hailed from the same middle-class, assimilated, Jewish Prague background and shared a mutual interest in Hasidic culture, literature, and Hebrew. The official book launch for A Hunger Artist and Other Stories will take place at The Supermarket in Toronto on September 14 at 4:00pm. Tagged with A Hunger Artist and Other Stories, Elana Wolff, Franz Kafka, Georg Langer, Menachem Wolff, Thor Polson.